Bring a small pot of water to a boil. Discard flavor packets for ramen noodles and boil noodles 1 minute. Drain, then rinse under cold water. 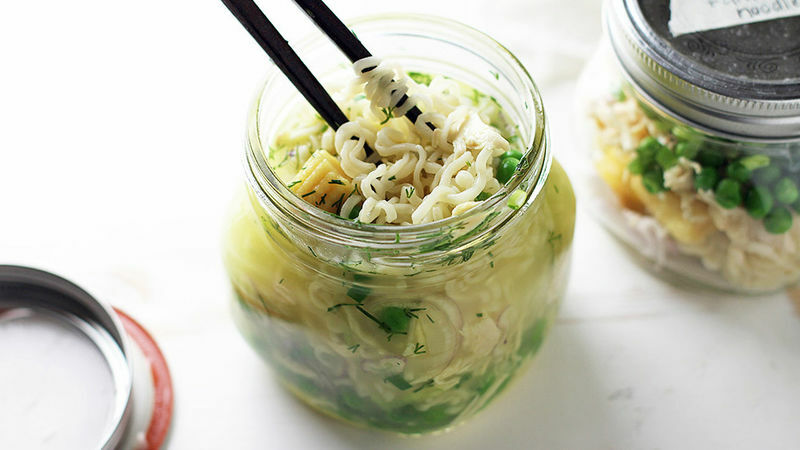 Divide noodles evenly among 4 sealable glass canning jars. 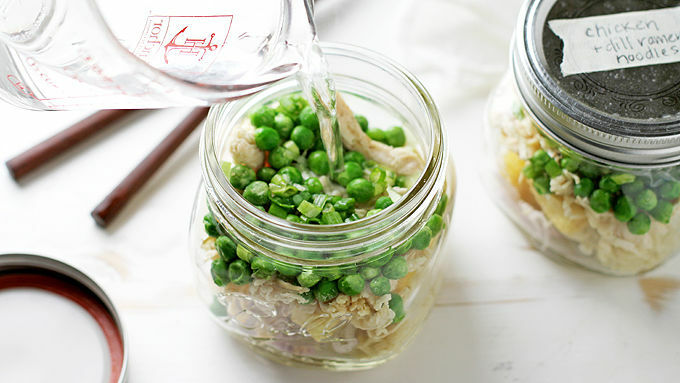 Divide shredded chicken, frozen peas, baby corn, chopped green onions, sliced shallots and chicken base evenly among jars. Season each with a dash of salt and pepper. Divide dill between 4 re-sealable bags; remove all air from bags and seal tightly. Place one bag on top of mixture in each jar and seal jars tightly. Jars can be stored in fridge for up to 4 days. To prepare, open jars, remove dill packet and pour in boiling water to the bottom of the lip of the jar. Reseal and let sit 3 minutes. Add fresh dill, stir to distribute ingredients and serve immediately. Swap dill for your favorite herb – fresh chives, parsley or tarragon all work well. Add chopped cooked mushrooms, snap peas, bamboo shoots, carrot coins, etc. to the mix. For lunch or a snack attack, these little jars are at the ready. 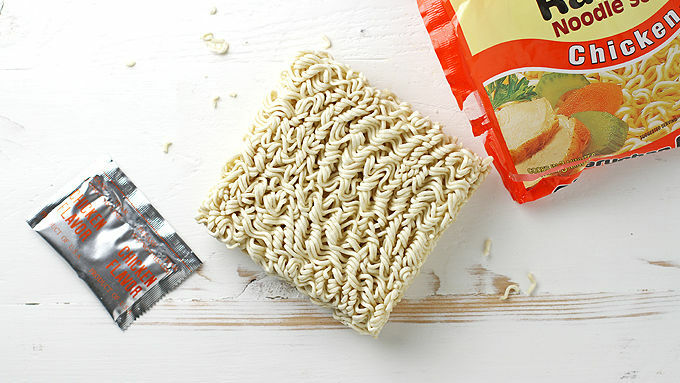 Did you know you can DIY your own instant ramen noodles? You can, and it’s oh so easy (and oh so tasty, yeahhhh). Let’s just call lunch what it is: Oftentimes, a brown bag of blah food. That’s why I am so on board with the food-in-jars trend that’s alive and well right now: You can prep a salad, a smoothie or a soup in jars at the beginning of the week, and just grab a jar on your way out the door. Now you’ve actually got something to look forward to at lunchtime! This recipe for chicken instant ramen noodles (inspired by this recipe from Serious Eats) is hands-down my fave food-in-jar recipe. I LOVE ramen noodles and have ever since I was a youth (but oy, with the sodium and the not-so-good-for-you stuff they pack in there). This version is homemade and with fresh ingredients, but it’s just as easy to make as a packaged version. You can prepare as many or as few jars as you want in advance, store them for a few days and make soup as needed. Huzzah for great (and yummy) hacks! Top the noodles with whatever ingredients you love – here, I added shredded cooked chicken, frozen peas, chopped green onions, sliced shallots, cut baby corn and a spoonful of chicken base plus a dash of S&P. But feel free to mix it up with your own favorite veggies and meats. 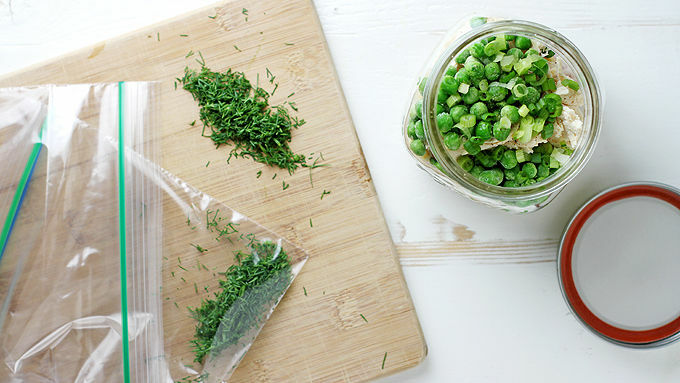 Chop up some fresh dill, place it in resealable storage bags and tuck each bag into the top of each jar. Keeping the herbs separate from the rest of the mix keeps them bright and fresh for when you make the soup. We want that flavah flav! (Psst – don’t love dill? Swap it for fresh parsley, chives, tarragon, etc.) Seal the jars and store them in the fridge for up to 4 days. That’s it, mah frands! It’s time to eat a not-so-boring, oh-so-tasty, food-in-jar instant lunch. I raise my jar to you. Cheers.